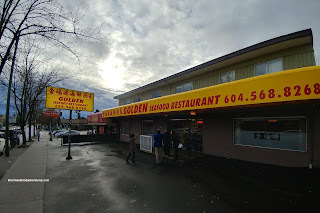 Fresh off a fairly decent Dim Sum service at the newly opened Golden Restaurant on Nanaimo, we figured that a dinner visit would be in order. Luckily we made a reservation as the place was packed for Chinese New Year. Formerly Golden Phoenix, then East Ocean and Phoenix Garden, the place settled on just Golden for its namesake. Not much has been done with the decor nor have they even changed the phone number. Looks like they changed the awning (but it does look like new ownership though). We decided to get their $138.00 set meal for six as it looked like a good value. 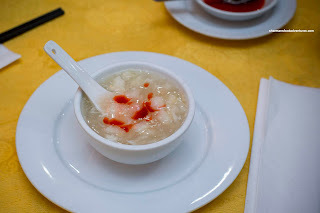 We began with the Fish Maw and Crab Meat Soup. Okay, before we get to the positives, there was one huge negative with the soup. This was thickened with starch (as it generally is), but they were too aggressive, making it very goopy and gummy. Beyond that, the soup was actually good with plenty of fish maw (which wasn't completely melted) and fluffy crab. It was mildly-seasoned though. 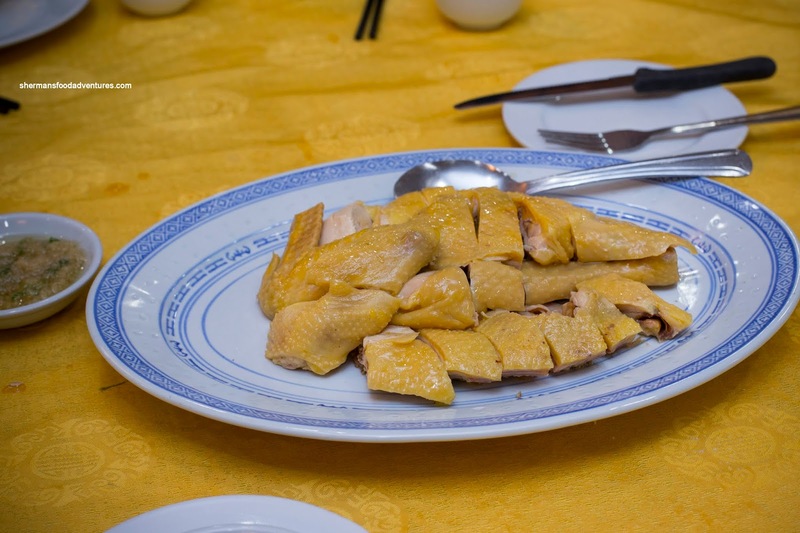 Onto our next dish, was had the Free Range Chicken with grated ginger and green onion condiment. Before I talk about the chicken, I have to applaud them for serving a legit ginger condiment as it was mostly ginger and tasty (some places just give u a bunch of green onion). As for the chicken, it was nicely gelatinized and tender (especially for free-range). 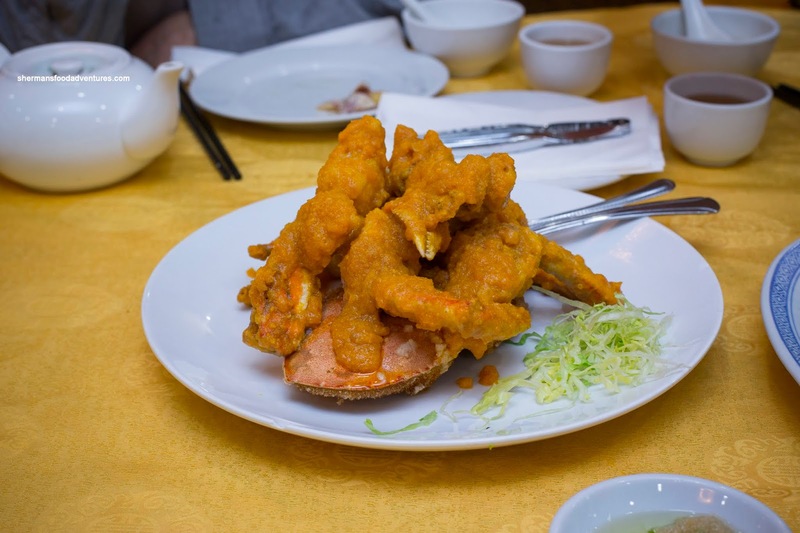 Originally, we asked if we could add Shanghainese rice cake to the Deep Fried Crab with Salted Egg Yolk Sauce (because it is freakin' delicious with it). They said the sauce wasn't saucy enough to add rice cake to the dish. Huh? As you can see, this wouldn't have been a problem. 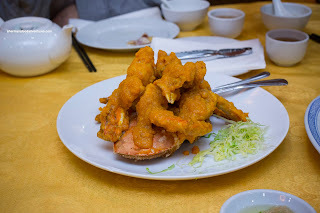 Whatever, the crab was fried beautifully where the meat was still fluffy. As for the sauce, it was sweet, salty and full of umaminess. 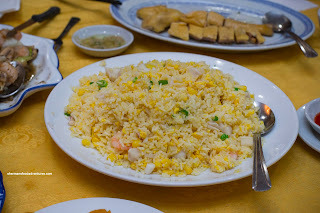 We ended up mixing it with the fried rice. Yum! 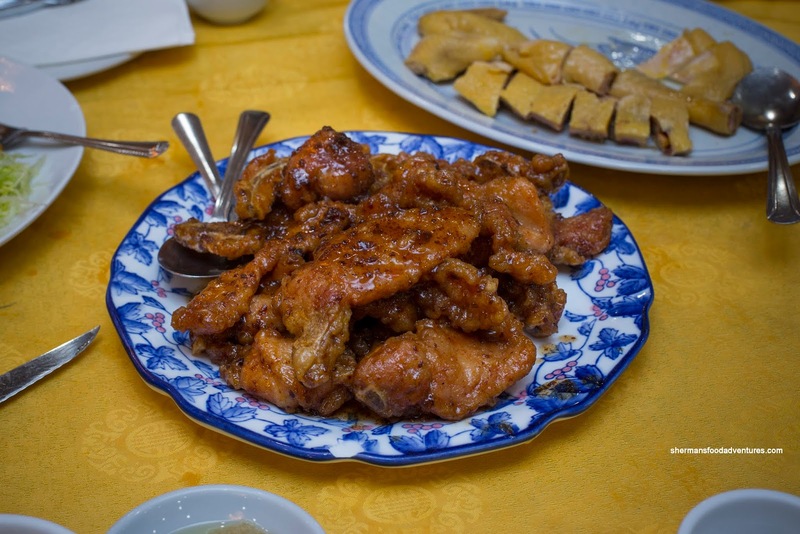 Our most favourite dish of the meal was the Dried Plum Sauce Pork Chops. This plate was massive where the pork chops were tender with a rebound texture. They were coated in an addictive sauce that was tangy and sweet with the unmistakeable zip of wah mui (dried plum). 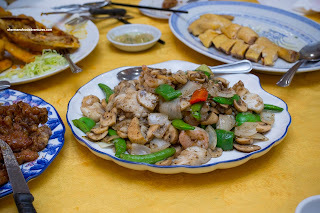 Also large in portion size, the Truffle and Mixed Mushrooms with Seafood was curiously good. We weren't sure if this was too much woodsiness for the delicate scallops and prawns, but hey, it worked. I guess the black truffle paste wasn't overused, so it was subtle enough. Furthermore, the mushrooms were not of the overly earthy variety either. Therefore, the seafood was still very much at the forefront. Strangely, the dish was too busy with far too many ingredients. 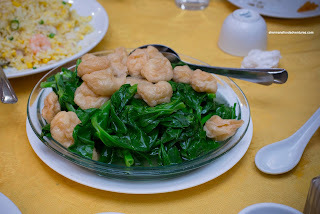 Our one true veggie dish was the Pea Tips with Puffed Fish Tofu. 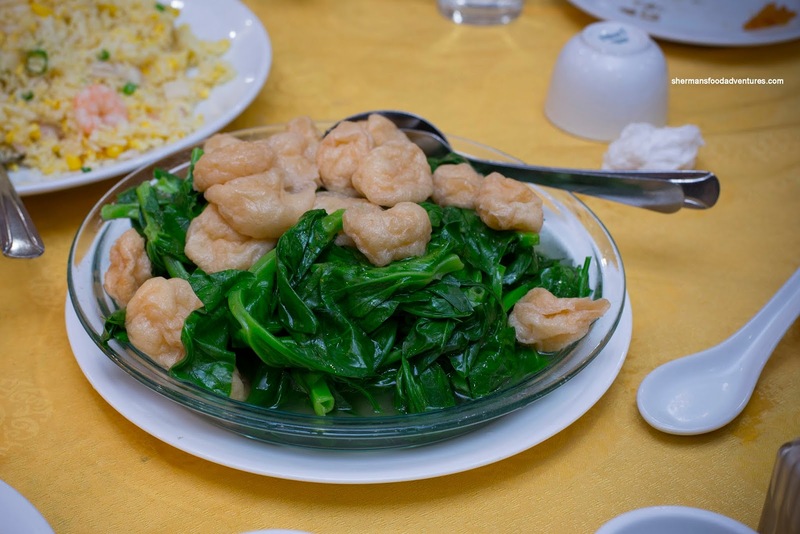 Once again, they really loaded up the casserole dish with tender pea tips that were perfectly prepared. They were cooked-all-the-way-through retaining a crunch. Seasoning was a bit weak, but it wasn't greasy, so the dish ate healthier. 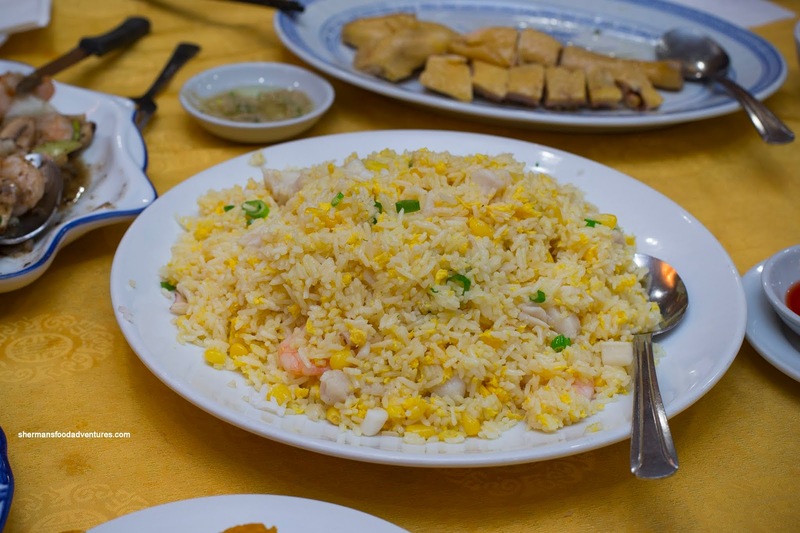 The least favourite dish was our last one in the Seafood Fried Rice. Again, it was large in size, but the rice lacked caramelization as well as seasoning. Hence the rice ate mealy and dry. It definitely could've used more oil and salt. 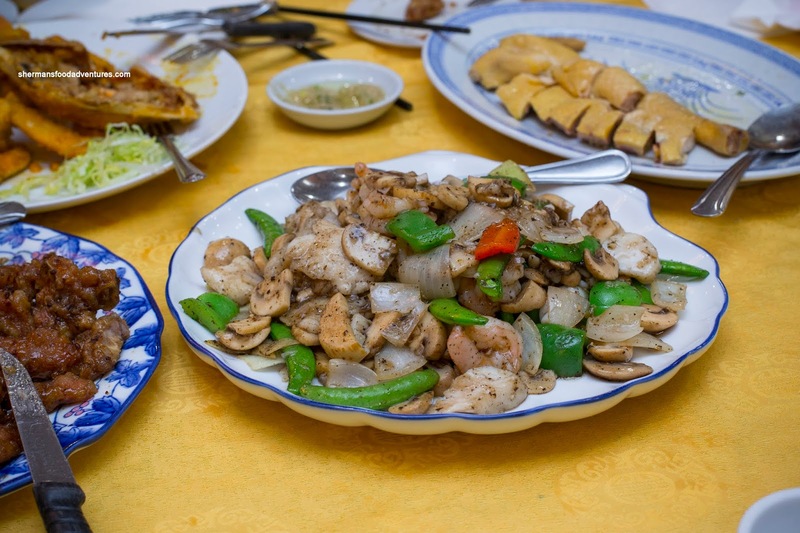 On the positive, there was a decent amount of well-prepared bits of seafood strewn throughout. I didn't get a chance to take a picture of the dessert (which was both sweetened red bean soup and baked tapioca pudding) as we offered up our table to the next party (the lineup was quite long). For that, they gave us extra dessert to go. Yes, the service was decent especially for a Chinese restaurant. Food quality was above average and prices reasonable. We will return.